A comforting organic bone broth made by simmering organic chicken bones with fresh veggies for 48 hours over a gentle heat. This way, the collagen-rich joints and bones are given time to gently release their goodness – the gelatine and a high amount of protein. Together with the veggies, the broth is given a wonderfully deep flavour. Warm some on the hob with a bit of water and use as a wholesome alternative to coffee and tea. Or use it as a hearty base for soups, stocks and sauces, or in your risottos and pastas to give them that much more flavour. 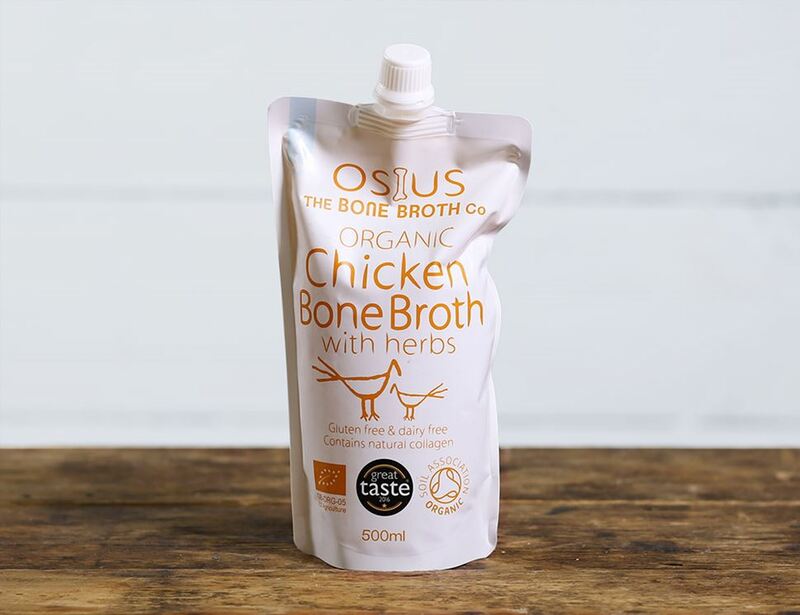 Osius believe to make truly good broth it has to be fully organic, pasture fed, simmered for days, free from any additives, and made with British bones. We couldn't agree any more with them. * = produced to organic standards. For allergens, including cereals containing gluten, see ingredients in bold. Keep refrigerated, once opened consume within 5 days. Can be frozen on day of purchase, once defrosted & opened consume within 5 days. Take required quantity and heat gently - do not boil. Can be taken neat or added to hot water. Also can be added to food during cooking as a stock.